Mid-Autumn Festival, fondly known as the Mooncake Festival, is finally here and what better way to make every family reunion all the more splendid? By savouring Häagen-Dazs’ signature ice cream mooncakes of course! The accustomed way to celebrate this day is to be with family and friends, as the full moon symbolises reunion among people. 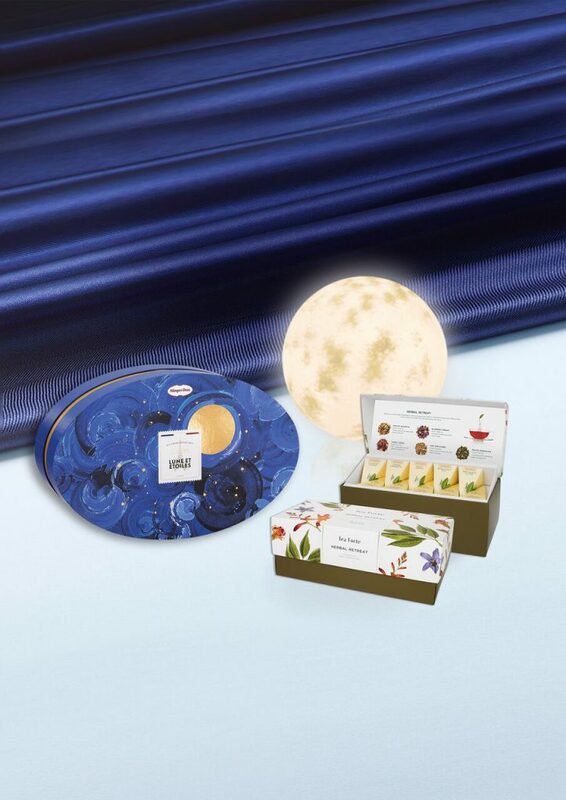 So with their exceptional range of premium-made flavours and contemporary designs, it seems to be the perfect way to showcase the spectacle of the full moon by gathering everybody around the table. 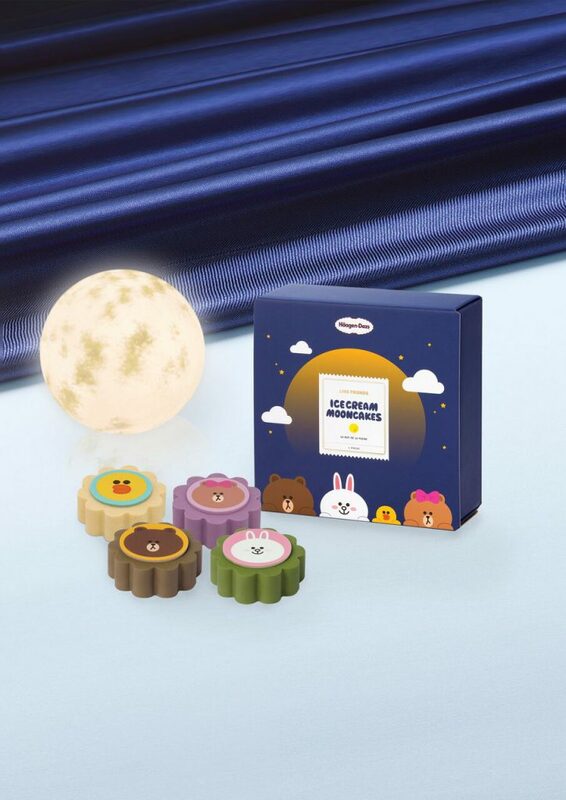 The ice cream mooncakes come in five different sets to choose from; the Lune Et Etoiles, the Twinkle Night Mix, the Mochi Collection, the Line Friends Collection, and the Crispy Collection, which can be paired up with the special X Tea Forte hamper. Each set is made with love, and premium ingredients that would get your loved ones going over the moon. This exceptional set features a very special moon surrounded by 7 stars – a very delectable set as you can see. It showcases an assortment of 8 Häagen-Dazs’ ice cream flavours (Strawberry with Lychee Raspberry, Strawberry Cheesecake, Cookies & Cream, Caramel Biscuit & Cream, Chocolate, Belgian Chocolate, Mango and Vanilla), with each ice cream mooncake coated in rich dark chocolate that brings out the elegance of its Parisian-themed design, only to give an unparalleled eating experience for you, and your favourite people. 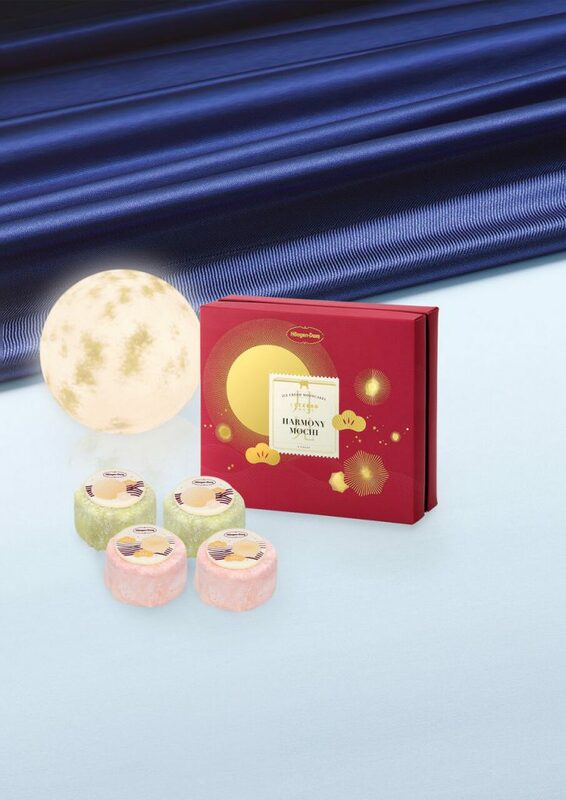 The Twinkle Night Mix set comes with 6 pieces of mooncakes. 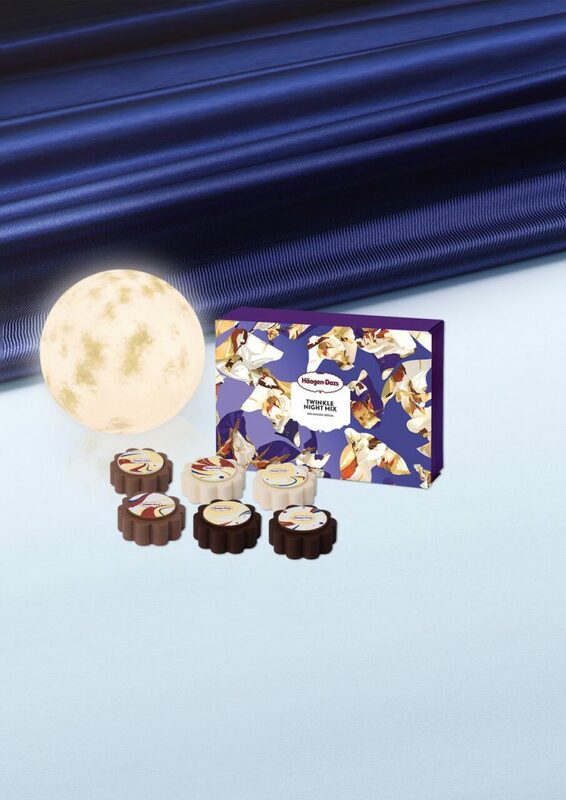 Each luxurious mooncake with its contemporary design is coated beautifully with chocolate. The 4 featured ice cream flavours are Chocolate, Mango, Summer Berries & Cream as well as Vanilla. A mooncake at a time to savour all night long. We know that a traditional mochi is all about its sweet sticky rice, but what’s better is that you get to indulge in mochi with ice cream, in just one bite! Since its debut, the Mochi Collection has been a favourite to many – highlighting Häagen-Dazs’ invigorating, creamy strawberry and mango ice cream flavours. Frankly speaking, to have mochi incorporated into an ice cream, is a blast of flavours in your mouth. You’d find the set wrapped in premium soft and chewy Japanese mochi skin, that brings Japanese delights to you, in such a wondrous twist. Line Friends are featured characters based on the stickers from the messaging app, Line. The set creates a fun, and friendly feel by featuring 4 adorable mooncakes of each of the Line Friends characters. What’s more is that, the mooncakes are coated with Pumpkin White Chocolate, Hojicha, Purple Potato White Chocolate and Green Tea Chocolate, with Macadamia Nut, Vanilla and Green Tea ice cream fillings. It’s enough to make any child’s – or even an adult’s – day a whole lot better. The all-time favourite collection of crispy wafers is back – sandwiching Häagen-Dazs’ ice cream that’s generously spread all over in smooth, velvety chocolate! Certainly sounds like a delicious set that would leave you craving for more! Not to mention the crisp of the wafer, which enhances the flavours of the ice cream, just the way we like it. Each box of five mooncake pieces are made with 3 exciting flavours (Vanilla, Caramel, Green Tea). A great indulgence for a change this mooncake season. So, what are you waiting for? Pre-order your choice of sets on July 30, and enjoy early bird promotions of up to 25%! 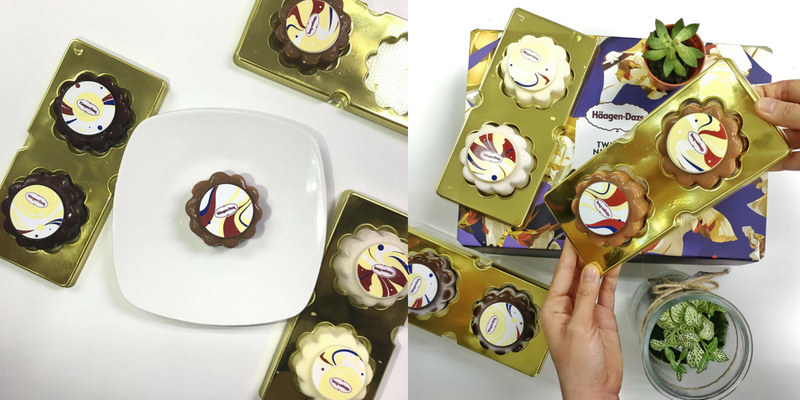 And don’t worry, if you are still craving for more – the ice cream mooncakes will be available in-store at all Häagen-Dazs’s outlet, Tangs.com, and selected mooncake booths, from August 14 so do hurry to place your orders before they are sold out!